The original print and web versions of this report contained errors in Table 9.F1. 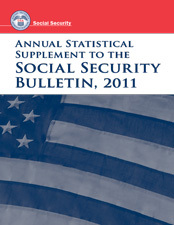 Data shown by age as of September 30, 2010 were incorrect. Corrected data now appear in the web versions of this report. The original print and web versions of this report contained an error in Table 6.D7. The average monthly benefit for widowed mothers and fathers aged 65 was incorrect. The corrected value now appears in the web versions of this report. The original print and web versions of this report contained errors in Table 5.A1.3. Data for nondivorced spouses erroneously omitted spouses entitled on the basis of "care of children." Corrected data now appear in the web versions of this report. The original print and web versions of this report contained an error in Table 3.C6.1. Data for 2010 on the number of OASDI beneficiaries who were "Disabled adult children under age 65" and "Disabled widow(er)s" were incorrectly transposed. Corrected data for 2010 now appear in the web versions of this report.